From the deep, arctic chill of meter-deep snow to the gentle, soothing canals of Amsterdam, our stop over on the way home could not have been more surprisingly balmy. We had planned for about half a week in Amsterdam after our time in Lapland, and upon arrival, stuffed our thick coats in our suitcases for the rest of the trip. We came to Amsterdam almost as an afterthought, so had little intention or plan, other than to wander the streets, perhaps shop a bit, and maybe visit another small city. Check, check, and check! Our first evening, we wandered the streets, and I admit, the dull smells and bikes coming from all directions did put me a bit ill at ease, but the colors on the windows and river: sigh. Can you tell how good the sun feels on my face? Here are the aforementioned cyclists that really seemed like a system I didn't understand. I literally reached for Walker's arm every time we crossed a street: cars, cyclists, motorbikes, trucks and pedestrians every which way. My father-in-law, on the other hand, understood everything about it, incredibly, and walked with ease. The lights were still strung for Christmas, and I wish they would stay all year, but we saw them de-stringing during the walk. Also seen on our walk, The Mouse Mansion, a store whose entire wall was covered with a huge doll house for miniature, toy mice. 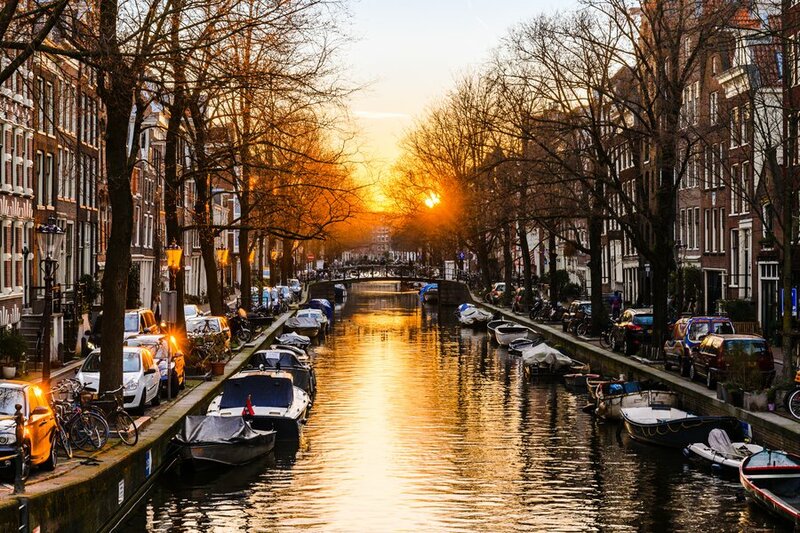 The sunset tones in Amsterdam, to me, are what jolts life into the city. The pink hue descends into the water as the night falls, and people (like us) just stand on bridges, watching how the light changes everything. The next morning, we walked from our hotel, Pillows Anna Von Den Vondel through the Vondelpark, a large, moseying park, to the Van Gogh Museum. We spent about an hour walking through the chronological look at his life. The crowds were intense, but we were inspired to watch At Eternity's Gate when we got home, a film depicting Van Gogh's troubled life. And, I'm always moved by artists who have suffered deeply. After a very rich and fabulous lunch at Ron Gastrobar, we headed back for more shopping, stopping for Van Wonderen Stroopwafels (meh), and a delicious sesame latte for me at Cold Pressed Juicery. After a lot of seeing mustards and orange tones in shop windows, we went back to the hotel. Next morning, we managed to book a private tour of the Rijksmuseum, the national museum of the Netherlands (pictured in the park, above), through our hotel, and we completely lucked out. Our guide, Henneke of Amsterdam Odyssey Tours, was fabulous. We were riveted to brush strokes and how the art in the museum had innovated and narrated the country's history. I love these photos, which show both the intrigue and pain of museums (for me, standing in museums often gives me headaches). The Dutch Master's, Henneke told us, were treated almost like sacred objects in a church; when the museum first opened in a protestant country, it looked so Catholic that it faced severe opposition. Truly, though, the Rijksmuseum is an museum which at once defines its country and opens new worlds and ideas. I loved the library. Last time we visited Amsterdam, we saw a small portion of the museum due to renovations, but it was open and in full splendor this time. We managed to squeeze in an afternoon in the nearby town of Haarlem that afternoon, but every evening, the light in Amsterdam . . . Meanwhile, we ate well and managed to find a few gems, although had quite a hard time chiseling them out when most places are closed Sunday and Monday, and we were there Sunday to Wednesday morning! Our favorite, and a highlight of the trip, was dinner at Sinne. The menu allowed a lot of flexibility in tasting lengths and was incredibly creative twists on the Dutch sensibility as a spice trading port in its history. The service was superb with the whole kitchen staff bidding us goodbye at the evening's end. The Dutchess was a decent hotel restaurant with a very elaborate chocolate explosion of a dessert and a very attentive waitress. And Spectrum, a two-Michelin restaurant, was so inventive the flavors shocked (almost every dish had tropical fruit twisted in), and awed. And overall, that warm glow brought us on our way with delight.